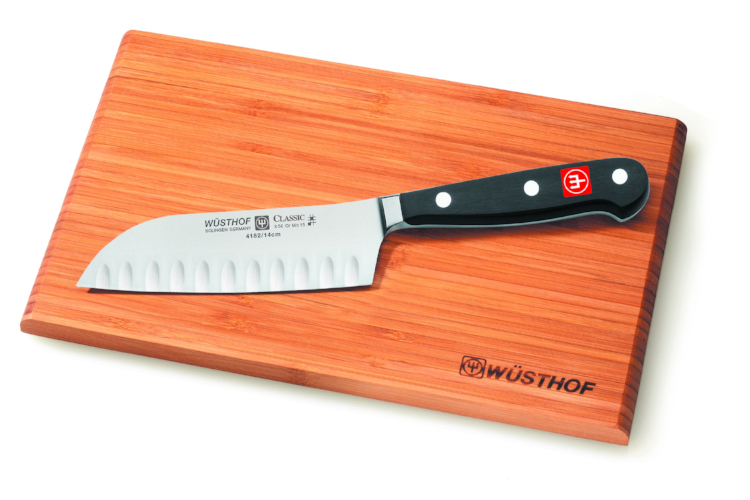 A great wedding or housewarming gift, the Wusthof Classic 5-inch hollow edge santoku with cutting board cannot fail to please. The razor-sharp santoku - Japanese chef's knife - has a hollowed cutting edge to prevent food from sticking to the blade. The handle is designed for comfort and has a stylish look. Made from bamboo, the 12 x 8 inch cutting board offers numerous advantages: it's lightweight, elegant and easy to clean. The set is complete with a lifetime warranty. Wusthof Classic knives are called classic for a reason. They are everything a chef expects of a superior knife. The handle is comfortable and handsome. The heft of the knife speaks quality and the balance of the knife is inspiring. The Classic line is Wusthof's most enduring line.